The Cellulosic Sugar Producers’ Co-operative is working on creating a new market opportunity for corn stover by turning it into sugar that will help in the manufacture of bio-based chemicals and biofuels. This will reduce dependence on non-renewable resources as well as provide new revenue streams for what are currently considered agricultural waste products or under-used resources. “It’s a very small group right now but the whole premise is to get to the stage where we can have a sugar mill producing sugar from corn stover,” explains Murray McLaughlin of Bioindustrial Innovation Canada (BIC), an organization involved in facilitating the commercialization of green and sustainable technologies. “We’re probably still two years away from getting off the ground in terms of sorting what the technology for the sugar mill would be, but it would be the co-op that would be the partners to a sugar mill to provide the corn stover or other biomass,” he adds. 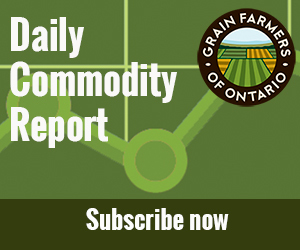 McLaughlin says Ontario farmers have become so efficient at producing corn that there is now too much stover left in the fields, and some of it should be removed in order to maintain soil health and productivity. He is currently involved in a biomass to sugars research project that is evaluating and making recommendations on the economics, availability and supply of biomass like corn stover and wheat straw, as well as available conversion technologies and potential markets. The ultimate goal is to bring a full scale, commercial cellulosic sugar plant to southern Ontario by 2018/19; forming the farmer co-op is an important step in establishing the new supply chain. Canada’s bioeconomy is evolving from an early focus on ethanol to a whole breadth of bio-based products and opportunities that will add value to many agricultural co-products that aren’t currently being used. Mark Brock was recently elected chair of Grain Farmers of Ontario’s Board of Directors. The District 9 (Perth) director is an active Twitter user. Follow him for updates from the farm, political news, and information about Grain Farmers of Ontario events and activities. The new Ontario Corn Nitrogen Calculator app is an update on previous calculators that were only available online.